Posted December 10th, 2012 by David Porter & filed under Hot Topics, MailBigFile, Social. Does Amazon Really Threaten High Street Shops? More thoughts about the digital retailing Christmas … the conundrum of a declining high street and the growth of the internet giants, particularly Amazon, at this shopping season. In 2002 Wal-Mart’s annual sales topped $200 billion, while Amazon’s rubbed along at under four billion. Today, Wal-Mart’s are around $450 billion with Amazon’s up to fifty billion. Still a massive gap. But the trend is what counts. Amazon’s sales have gone up 12 times with Wal-Mart’s merely doubling in the decade. And that is set to grow exponentially as shopping moves to smartphones and beyond. Last week we highlighted the dilemma faced by shoppers this season: to go online with risks but convenience or go into town with its costs and inconvenience. The Distressed Retail Property Taskforce is just one example of the government being seen to try to stem the online tide as property prices and values tumble in retail and the traditional high street begins to fade over the horizon behind. Over 30 shops a day are shutting, more or less permanently. More than 100 new online shopping opportunities open somewhere. Bricks and mortar in anywhere but top, prime locations, will give way to clicks and touch screens. Talk about online shopping and everybody thinks ‘Amazon’ are the culprits. Bookshops, music stores, white goods retailers have all fallen in the face of the web machine. To an extent that’s true. But Amazon is not alone, there are other competitors. Many retailers have embraced the web with open arms and are exploiting it gleefully and successfully. Back in October, Amazon’s founder Jeff Bezos told Matt Warman at the Daily Telegraph, that he refuted allegations that he is destroying high street shops. ‘The competition will make everybody better’. 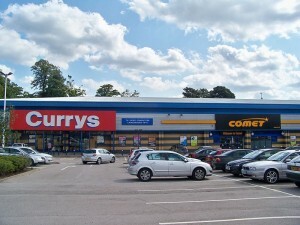 His job, he argued was to provide the best efficient service, low prices and the best selection. He said: ‘High street shops will evolve so they won’t freeze in time – they’ll change, they’ll evolve, they’ll figure out a new path’. He refused to take any blame for ‘the revolution on the high street’. Amazon employs 70,000 people and sells almost anything that anybody wants round the clock. It also enables thousands of ancillary jobs in delivery/logistics, IT, manufacturing. It is tempting to think of it as all-embracing, crushing every other business in front of it. The Kindle Fire HD takes on Apple’s iPad, a total multimedia tablet. But Bezos said he didn’t want to get into building gadgets, seeing Amazon’s prime motive as ‘building services’. He reckons to make more money on goods that customers buy after their Kindle than at the time, with the hardware selling only at break-even level. As people can read a Kindle book on an iPhone, BlackBerry or Windows phone, ‘we’re the opposite of competitive, we’re partnering’. He summed it up, as ‘a huge diverse business that is defined by its customers and made possible because of the internet’. Well, the jury is still out on that one, do you agree?